Glass kitchen cabinet doors are very stylish and classy when it comes to showing off your expensive or antique cookware, china and dishes. Decorative lighting can immensely highlight it from within and create a very rich look. However, there are a few considerations to make when selecting glass for your kitchen cabinet doors. You may want to go for transparent, textured, opaque, colored or a designed glass depending on how much you wish to display or hide. Transparent glass is suited for cabinets used for dishes or china on display. Textured glass is rough to touch and comes in different varieties. Opaque gives a frosted look and can be used for glass look with items hidden comfortably. Colored or designed glass can add a touch of art to your kitchen and keep the items inside the cabinet hidden. When choosing doors, it is best to go for unfinished kitchen cabinet doors. 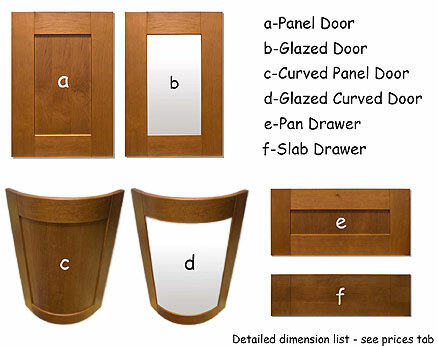 You can get high quality oak and maple doors well within your budget. That is because you don’t have to pay for the final design and finish. You can comfortably bring home doors that will fit in place of earlier doors and give them a look and finish you want. Keep in mind the exact measurements that you need. You can install glass or metal wire front to the door to enhance its look. However, all this must be done before you finally install the doors. Kitchen cabinet door styles are the most striking feature and should be in sync with the overall style of your kitchen. There are various styles to pick from: Shaker, Mission, Recessed, Arched, Slab, Raised cabinet and Panel inserts. Shaker style is a simple square with recessed glass or wood panel. Mission style comes with pegs at the joints. Recessed style shows depth through the distance between inner panel and frame. Arched style has a roman arch at the top of frame. Single piece of wood is used in Slab style. Kitchen cabinet door refacing is another great way to give your kitchen a whole new look. Not only is it cost effective, you can give it the exact look that you wish to. In order to begin with door refacing: you need to remove them from cabinets; remove any handles, knobs etc. ; clean them and sand them off to remove rough layers. After cleaning them properly, you need to laminate them in style that you have selected or you can even paint them to create an artwork. Remember to drill back holes to match the previous holes for handles or knobs. Reinstall the doors back onto the cabinets. You are ready with a whole new look for your kitchen. Refinishing kitchen cabinet doors is yet another affordable way to give a new feel to your kitchen cabinet doors. Refinishing process involves a good amount of work, so be ready to spend good amount of your time in doing so. In order to refinish your cabinet doors, you need to uninstall the doors from the cabinets and clean those thoroughly using spirits. Once dry, sand the old finish completely. For complete new stain to adhere, it must be completely cleared off the old finish. Remove the dust and apply the new stain. Two to three coats of the stain are required to give a finished look. Once dry you can reinstall the doors back onto the cabinets. Either of the above options can give your kitchen a complete makeover. How you go about it will ultimately depend on your style, budget and time available. Excellent information on kitchen cabinet doors! I will be browsing back again on a regular basis looking for more information.